This was revised in 2005 reflecting the last change in route to date. You may use this chart as long as it remains totally intact as you see it. 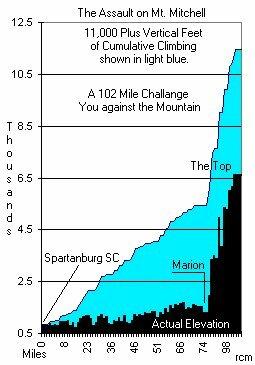 This is the climbing chart for The Assaults. Both Marion and Mitchell are marked on the above chart. of the total climbing to get to the top. The last 28 miles from Marion up to the top is the other half. Just a little more than 6000 feet to go! Be in shape or drop out. The sweep wagon ain't far behind !